We have a lot of fun in what we do in trying to save the world. 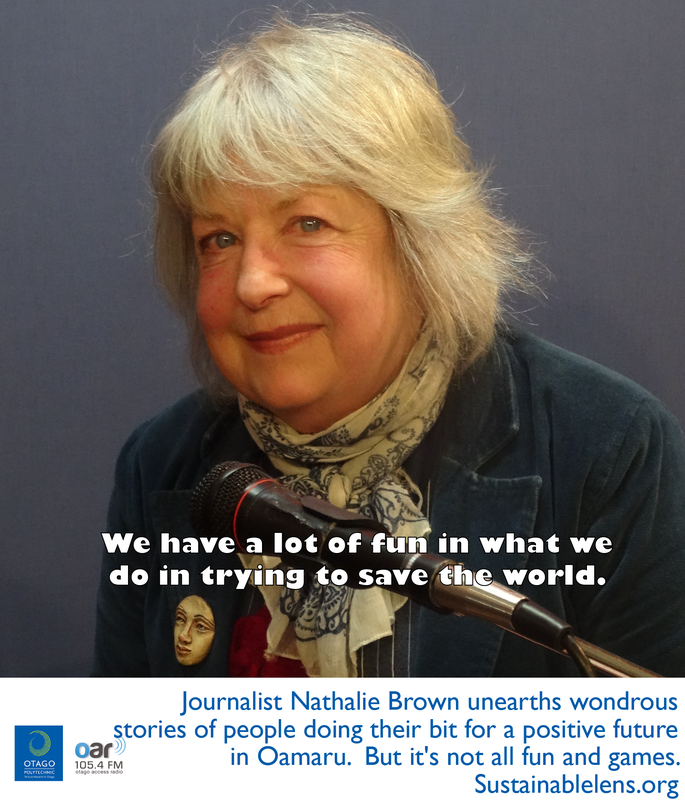 Nathalie Brown is a journalist living in Oamaru. She tells us how she first found Oamaru a “wondrous place”, and on returning decades later, an influx of artists and artisans had breathed new life into the town. 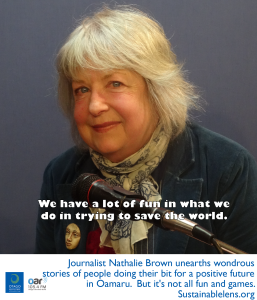 She is involved in the Natural Heritage Society and is busily unearthing stories of people doing their bit to create a positive future. Oamaru became home 11 or 12 years ago, it really is the most extraordinary and remarkable place, I just love it. I came back to Oamaru and found people in fabulous tartan kilts, with feathers in their hair…extraordinary people with wonderful life and I thought this is for me. There’s something about the energy of the place that you don’t find in other places. I don’t know if the people created the spirit, or the spirit created the people. I think the first thing was the built heritage. The establishment of the Whitestone Civic Trust in 1989 brought new blood into the town. I was always socially aware, leftie, greenie, but I didn’t really have anything to pin it to. The implications of climate change and peak oil…something’s not right, what can we do about it? what can anyone do about it other than throw your hands in the air and being in despair? There’s more than a lifetime’s exploring to do here. I love encountering people in their workplaces and their homes, and talking to them about what gets them out of bed in the morning. You have to be curious. You find unusual people doing extraordinary things. What have we got, how can we make the most of it for everyone? (Success in last couple of years?) Being here for my aged parents, and being at my mother’s bedside while she was dying – the most extraordinary, magnificent, wonderful , phenomenal experience I’ve every had. (Activist?) Yes. In terms of getting involved in groups and committees. If something really gets me going then I’m going to pursue it – seeing where I can take this social justice issue of the workers in the residential care social places – I will be pursuing that. (Challenges?) Learning how to earn a living. (Miracle? or smallest thing that would make the biggest impact?) Some kind of universal will to do something about the effects of climate change. The nuns taught us, if you have a sense of moral outrage, then you can do something. Who would have thought that apartheid would collapse? it was just one of those things that is. If we could get a political will at the next climate change meeting – we’ve stuffed it up, what can we do to keep it under two degrees? What can we do? Let’s do it. It would be a miracle, but it could happen. What’s Oamaru going to be like in 20 years time? What’s the world going to be like in 20 years time – it could be fabulous. But on the other hand it could be absolutely dreadful. (Advice for listeners?) Learn to meditate.